DDA designs a website for new and replacement windows and doors with a clear view on quality. When ModernView® was ready to market their line of Professional Series Windows and Doors online, the organization turned to Dynamic Digital Advertising (DDA) for a new website design. With a plethora of beauty shots from contractors, ModernView wanted to showcase them in an engaging way for users. One of the main challenges for the website was to distinguish two user groups – those looking for replacement windows and doors, as well as those involved in new construction. Specifications were not only different for these two user groups, but also differed from region to region, so it was important to implement a menu structure that enabled user-friendly navigation. In addition to the challenges aforementioned, ModernView wanted to provide users with all relevant industry resource materials. That said, DDA planned to integrate News and Technical Data sections within the site that were easily accessible from every page. At the time of development for this website, there was a tax credit available for energy efficient improvements, and ModernView’s Energy Star-rated Windows and Doors more than qualified. DDA would plan to incorporate a highlighted area of the site to bring attention to the tax credit, but design it in such a way that it could be removed once the tax credit expired without compromising the design. Plus, to help users find a ModernView Windows and Doors dealer based in their area, DDA planned to program a dealer locator tool. For ModernView Windows and Doors custom website development project, DDA produced an easy-to-navigate site in which the design was compatible with an existing brand identity. Not only did the contractor beauty shots become the crux of the design, DDA created a photo gallery with 40 pictures representing different looks and applications. To further demonstrate available options within ModernView’s line, DDA devoted a page of the site solely to the laundry list of shapes and patterns potential homeowners or contractors should consider in their buying decision. DDA created a menu structure for the site that made it easy for users to choose a new construction or replacement window or door type, choose a state from an interactive map, and obtain the exact specifications they need in two mouse clicks. To help users find a dealer in their area, DDA programmed the dealer locator tool to search by state or zip code and return a list of dealers closest in proximity. DDA created an eye-catching ad for the tax credit that was embedded on all pages while the tax credit was in effect. On all specification pages, there are thumbnail pictures of the windows and doors, which when the user rolls their mouse over the thumbnail, the image changes to show the window or door in operation. 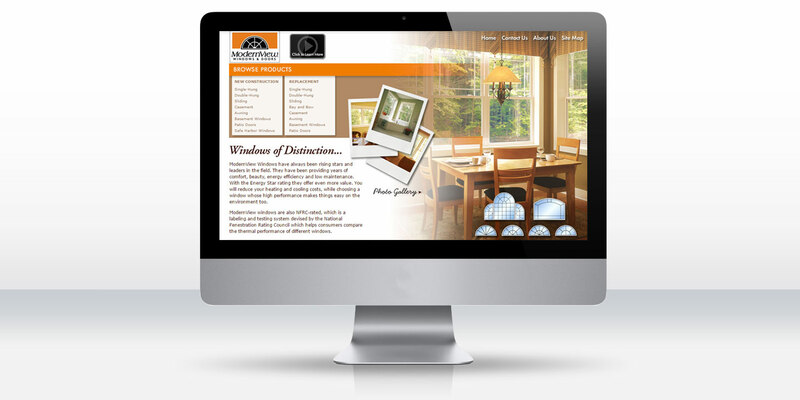 This website design was completed in 2007 and still serves ModernView well today. Since its initial launch, ModernView contracted DDA for the design and development of two other websites – one for cabinetry and the other for composite decking. Each have their own distinct look, but one thing remains constant – quality products represented by quality websites.